Gambling is the wagering of something of value, usually money, on the outcome of an event or game. As an activity heavily criticized by some, gambling still faces many legal restrictions in the United States. Nevertheless, the industry makes a total contribution of around 137.5 billion U.S. dollars to the U.S. economy annually and directly employs more than 730 thousand people. 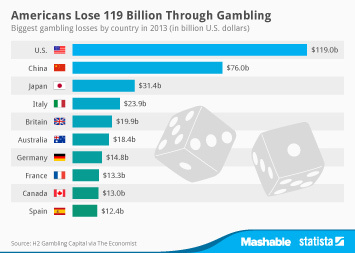 Worldwide, the gross gambling yield (GGY) of the gambling market was forecasted to grow annually to reach 495 billion U.S. dollars in 2019. Las Vegas Sands was the largest casino company in the world in 2017, with revenues of around 12.88 billion U.S. dollars. As its name implies, the company is based in one of the world’s casino and gambling capitals, Las Vegas. In a 2017 survey, 27 percent of those visiting casinos in Las Vegas said that they budgeted between zero and 99 U.S. dollars for their trip. Visiting casinos is not the only way to gamble. Another growing segment of the gambling industry is online. The global market size of online gambling was forecasted to reach over 59 billion U.S. dollars in 2020, growing by around 20 billion U.S. dollars in just five years. The largest share of this industry segment is made up of casino gambling and sports betting. More interesting topics from the industry "Gambling"